If you live in the south where the weather is beautiful all year long, I'm sure you take for granted the fact that you can buy or grow wonderful salad greens, vegetables and fruits whenever you want, so this post isn't for you. But if you, like me, live in a more Northern area where growing is seasonal, then you might find my experiment interesting. I live on the Northern West Coast, so even though the weather here is mild compared to other parts of the country, it's still too cold to grow a garden year round. And even though salad greens and vegetables are available, they are becoming more and more expensive and the quality is getting worse and worse. I looked at my shopping records for the last year and found them extremely depressing. 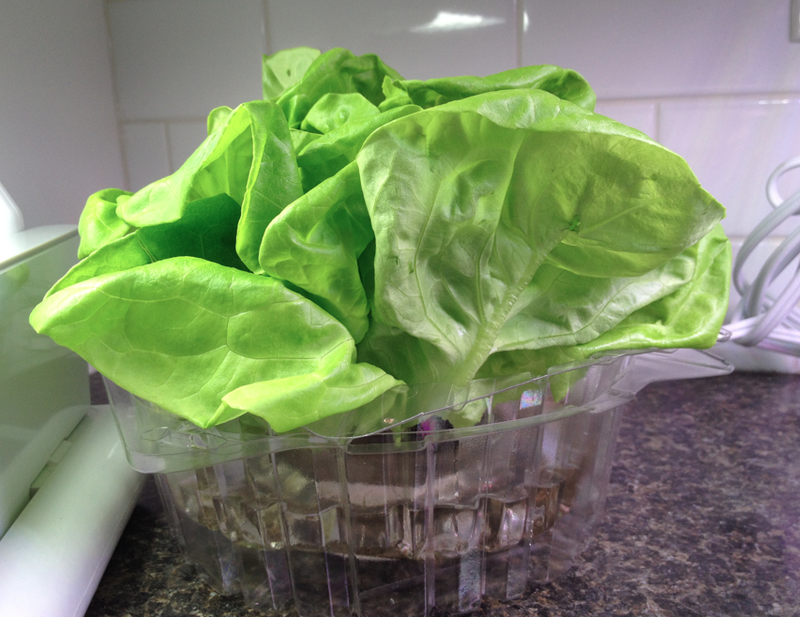 I bought a small container of organic mixed salad greens and a small container of organic baby spinach every week. These cost me $5.99 each, and because they all have to be transported, a lot of them were bad. The choice was to throw away 1/3 to 1/2 the container or not have any salad greens at all. If you figure on half the year being winter months (and for many it's even more) that works out to approximately $150.00 that goes into the garbage which just isn't acceptable. With all the new technology I figured there had to be a way around this so I've decided to do some experimenting. After spending a few weeks researching online I've decided to set up an indoor garden consisting of 4 parts. Here they are, starting with the easiest to implement. 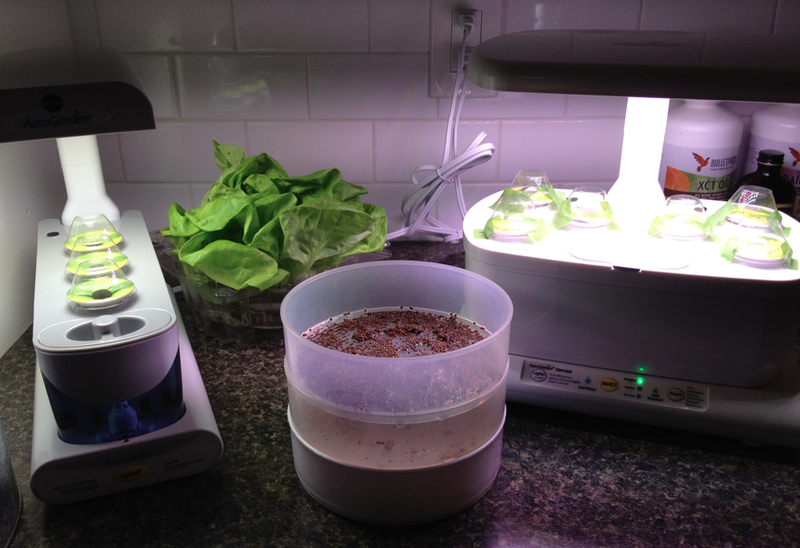 Instead of buying baby greens this winter I am starting with frozen organic spinach and living lettuce. A living lettuce costs me $3.99 each. It comes with the roots attached, so if I keep them in water it should stay fresh for the whole week which will end up giving me more to eat then the half edible container of baby greens. There is also the possibility that I might be able to grow more leaves by adding some fertilizer to the water - but that would be a bonus. This plus the frozen spinach are substitutes to hold me through until my "garden" plants grow to edible size. The next part of my garden consists of home-grown sprouts. This takes the place of a sandwich blend of sprouts I used to buy for $4.99 a container, and also broccoli which cost me $6.99 a head - and this wasn't organic broccoli either. When I was doing my research I discovered that broccoli sprouts have 5 or 6 times as many nutrients as actual broccoli, so adding these sprouts to my salads will give me all the benefits at much less cost. 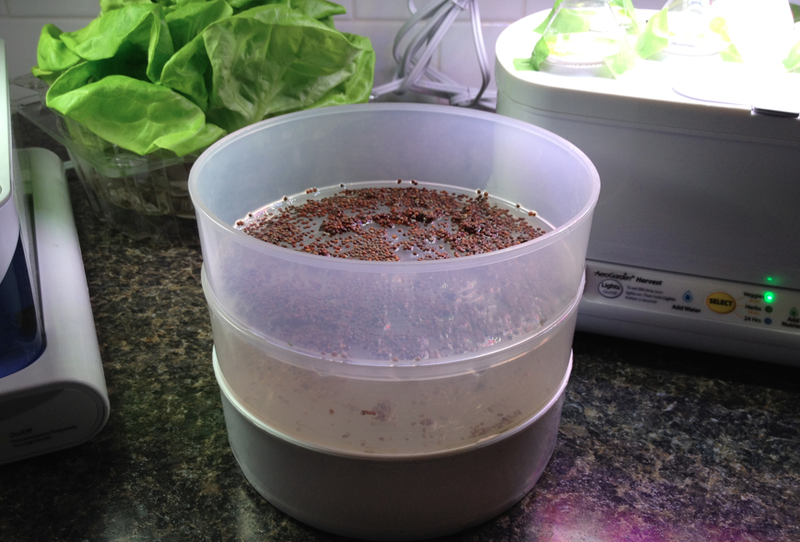 I found a cheap spouter on Amazon and also a mix of organic seeds. I've been using this now for several months so I know it works well. The one I bought comes with 4 sprouting trays. I start a new tray twice a week. It takes 3 to 4 days for the sprouts to grow and they are much more delicious than any of the ones I've been able to buy in the store. I grow these year round instead of buying sprouts and broccoli and I've saved quite a bit of money already. The next part of my indoor winter garden is something I'm just now starting so it's an experiment. There have always been grow lights that you could buy to grow indoor plants but they usually required a lot of time, effort and space to set up and the results were not always great. Now I've found a new (to me) product that seems to be getting a lot of rave reviews on Amazon. There is an initial cost to set this up, but if it works as well as everyone says it does, it should more than pay for itself in the long run. 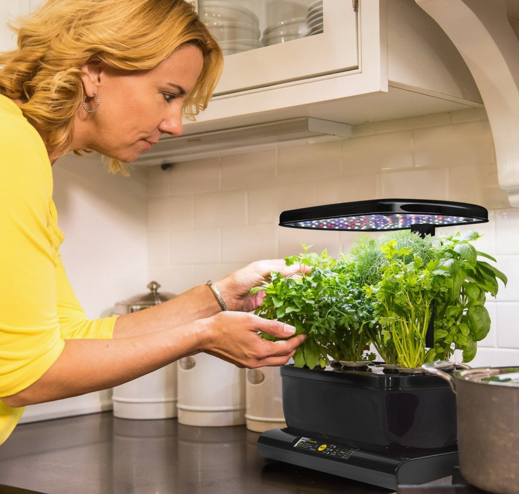 I'm talking about AeroGardens and they come in various sizes. You can spend anywhere from $70 to $400 on these, but if like me you just want some fresh greens, then something in the medium range (up to $150) will be sufficient. 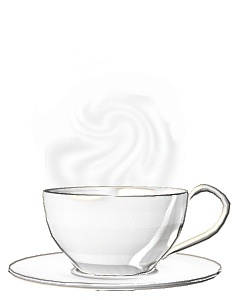 They come in either black or white so you can choose which will best fit into your colour scheme. And even the largest ones are very compact which is a major plus, especially if you live in a condo or apartment. You can also get taller ones that will allow you to grow cherry tomatoes as well - something I'll try next year if this year's experiment is successful. One of the big pros is that plants grow very quickly in these units. Salad greens sprout in 5 to 8 days and are usually ready to eat in as little as 3 weeks. 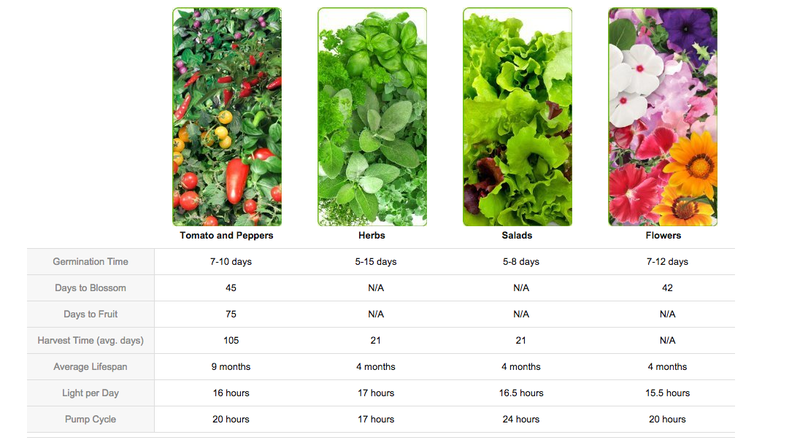 Herbs sprout in 5 to 15 days and are also ready for picking in about 3 weeks. The average lifespan is about 4 months so you can pick through most of the winter from one sowing. To start with I've decided to try two different types of AeroGarden - one of the larger newer six pod size for salad greens and a smaller older type with a replaceable bulb for herbs. This small one is one of the cheapest but it does have a few cons. 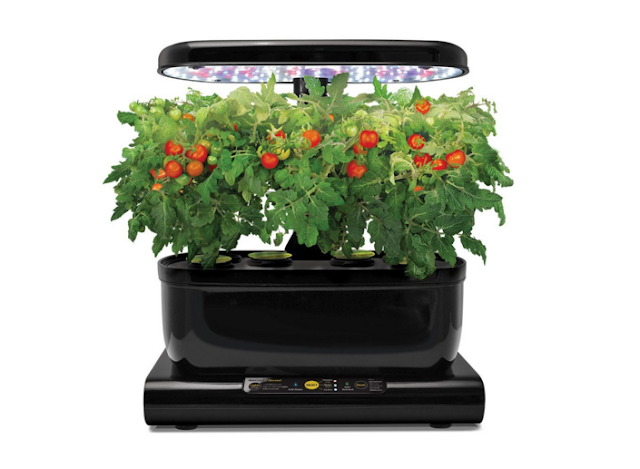 The light has to be replaced every six months which is an added expense, and some of the reviews say plants don't grow as well or as quickly. However it seems to work well for herbs so I've set mine up with a dill plant, a basil plant and a parsley plant. These are the fresh herbs I use most often and since I can pay $3.99 for a few fresh sprigs in the middle of winter, this will allow me the luxury of using fresh herbs at times of the year when I don't want to pay a premium for them. The last part of my garden is the most expensive but I'm hoping it will also be the most productive. 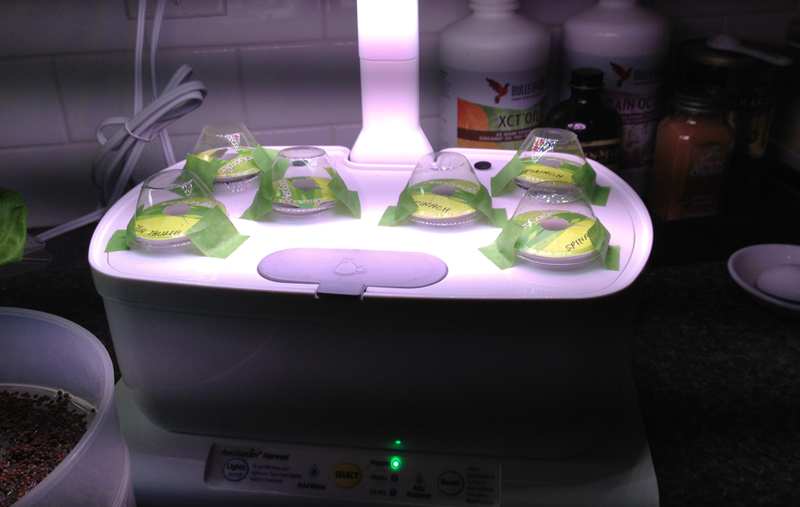 This is a six pod growing unit and I bought a separate kit for growing your own seeds. I've used this to plant 3 pods with spinach and 3 with Tom Thumb lettuce - a kind of mini Boston lettuce that will hopefully take the place of the living lettuce once it matures. 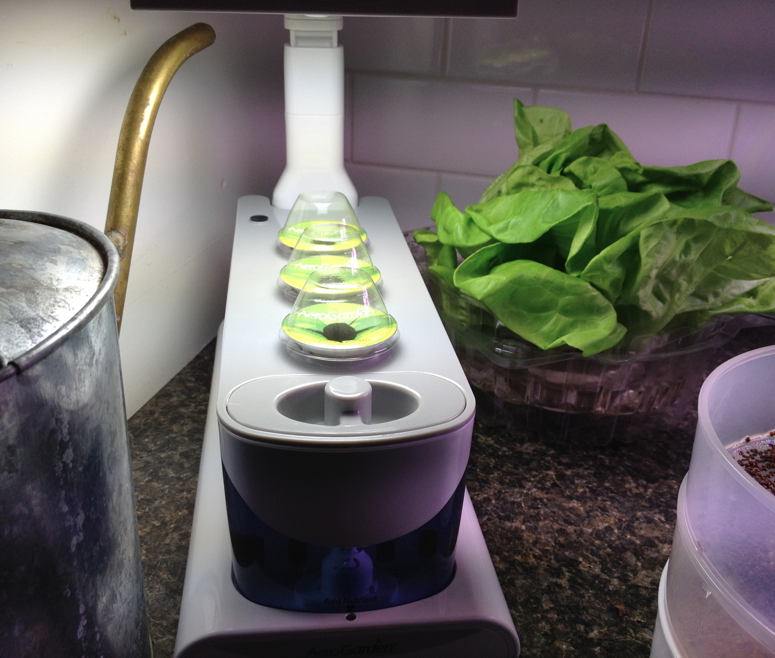 You can buy many ready planted pod kits but I haven't found one with spinach so having the grow anything kit is great. The only annoying thing is you need to iron the labels for them to stick. Not having an iron I ended up using masking tape to attach them instead. No big deal. I have dedicated a 2 x 2 foot square of counter space in my kitchen for my winter garden, but you can grow it anywhere that you have an electric outlet and a reasonable temperature. 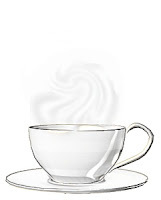 The smaller ones can even be placed on a bookcase or side table in your living area if kitchen space is at a premium. I would recommend you keep it in the kitchen however if this is at all possible. It will make it a lot easier not only for watering but also to use. The nice thing about this system is that it doesn't require any outside light - in fact you are instructed NOT to place it in a window or under lit kitchen cupboards. 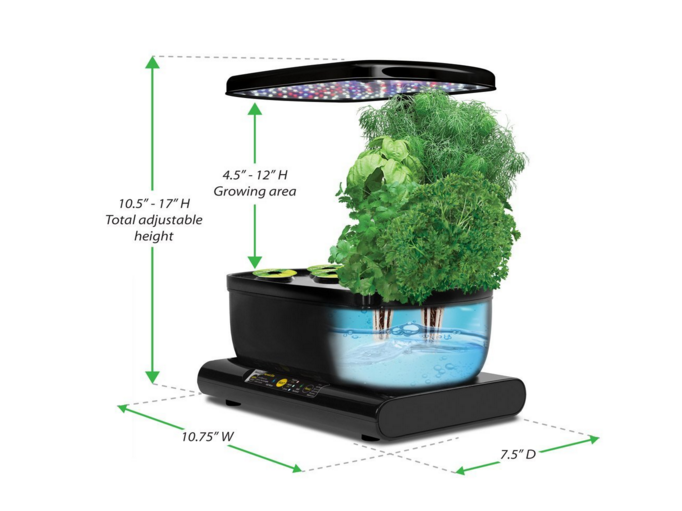 This gives you lots of leeway and will allow you to grow plants even if you have to use an enclosed room with no natural light whatsoever. The light included in the grower is all you need. These plants grow in water soaked seed pods with fertilizer added to the water. 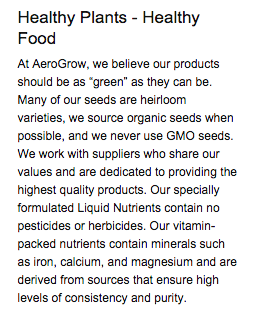 They are not sold as organic but the writeup (see above) states that there are no artificial or chemical fertilizers used and that organic seed is used in the pods wherever possible. Maybe not totally ideal but certainly better than non organic produce grown in fields with an unknown amount of chemical fertilizers and sprays. Of course you can always bypass their fertilizer entirely if you wish and use your own organic fertilizer. Since you add it to the water you also have that option. So this is my experiment this year. Instead of throwing away $150 on inedible greens I'm using that money to set up my indoor winter garden .... and we'll see how it goes. Hopefully in a couple of months mine will look like this !